I'm sorry that this post came late. My blog just turned one year old on November 01, 2010! "Happy blogoversary to Simply Rins! Truly, time flies when you're having fun! I'd like to dedicate this post to you, my readers, old and new, who motivates and inspires me (really) to continue embracing my individuality through nail art and through the things that I find quite interesting to share. I started this blog with travel posts. I wrote 3 articles regarding my trip to Cagayan de Oro and Camiguin Island. However, I am not a frequent traveler so this blog eventually featured personal tidbits of just about anything. After a few posts, I got discouraged because I got worried that my blog will not have any direction. It was also during the early stages of Simply Rins that I found myself in a crossroad that involved my love for cartooning. Yes, I draw and maintain a comic blog entitled I Am Potpot. Until now, I still have to update my comic blog. I promise to do that really soon as I really miss cartooning. My dilemma back then also affected my personal blog as I found lesser time to write. A dear friend encouraged me to continue Simply Rins and said that eventually, I'll find the direction that I was looking for. He was right. I would not have guessed that my personal online space will primarily turn out as an expression of my being a nail art enthusiast. This post, of course, will not be complete without a nail art! I was tossing and turning before I decided that I'd like to reminisce my 1st blog year through my nails. And so, I've recreated some of my favorite nail art and represented some nail art techniques that I've learned within the past few months that I've started painting my nails. My nail art history in my hands. Trips to a nail salon became a constant stress reliever for me after I graduated from college. I wasn't so experimental with colors back then. I was a girl who would always request for a french manicure. Eventually, I dared myself to try out other colors. I can't exactly pinpoint the time when I started to love designing my nails. But since it was rather expensive to have them done professionally, I rarely get one. I then resorted to nail stickers. And so my first nail art posts only showcased nail art stickers. A closer look on my right hand. 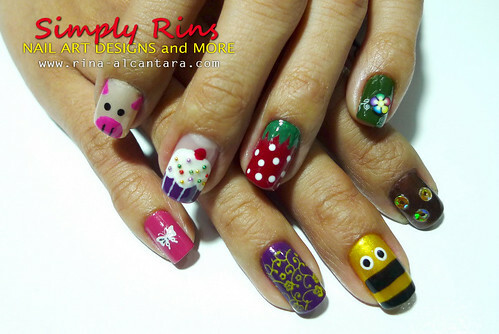 From left: nail sticker, stamping nail art, bee inspired nail art, and sequins. My curiosity about nail art kept growing and soon I found myself searching for tools and accessories. I was introduced to rhinestones, beads, sequins, and the likes! I still have yet to explore the possibilities of these accessories though. It was also at this time that I discovered Fimo nail art. By now I'm sure you all know that I'm fascinated with freehand nail art. I partly blame my being a cartoonist for this inclination. A closer look on my left hand. These are freehand designs that I've done in the previous months, except for the index finger, which is a combination of stamping and Fimo nail art. For the longest time, I'm discouraged to create freehand nail designs because I couldn't paint with my weaker hand. I always end up disappointed with the results. But I guess when you really love something, you'll always find a way to get it. So I decided to take baby steps by coming up with designs that comprises of simple shapes and lines so that it will be easier to work on my right hand using my weaker hand. So far, it's working for me. 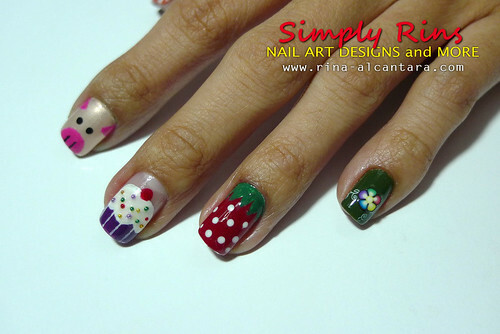 Strawberries were my first inspiration for freehand nail art. I've seen a lot of strawberry nails online and I wanted to try it for myself. I recreated it here using the techniques I've learned and used a different color palette. My favorite is the Cupcake nails that I did with tiny beads. The bumblebee inspired nail art is probably the easiest freehand I made. It was a simple combination of lines and dots. My Three Little Pigs has become one of my favorites too. Within the few months I began to do nail art, I've joined 2 nail art contests. The first one was hosted by The Daily Nail with the theme "No Place Like Home". I didn't win but it was the first time I challenged myself to do something unique with my nails. For a time, that nail design became a fixture on the banner. I decided to take it off just this month. The Crawling Spider on the left thumbnail and Googly Eyes on the right. The Crawling Spider nail art is my all-time favorite so far. I entered this design at Polish Freshie's Halloween Nail Art Contest. This nail design will be unforgettable as it took a dramatic (so to speak) turn when the results of the contest came out. I resented that my character got questioned. But I didn't want to engage in further online debates, so I took a back seat after explaining myself and watched the events unfold. I was saddened by some of the facts that were revealed. It actually surprised me that some would resort to things I can't think of myself doing. Some things are not to be taken too seriously. My Crawling Spider won amidst the crisis(?). To friends who voted, emailed, and sent messages, thank you so much. Simply Rins' 1st blog year came with a lucky streak. I've joined a few contests with prizes that I love and actually won. My first online win came from Hello To Earth. I've used some of the prizes already and I'm still using the beauty products. 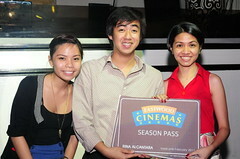 I got the Eastwood Cinemas Season Pass through my Potpot Loves Eastwood City entry to Eastwood Mall's contest. It's a free movie access that's valid until February 2011. I definitely love this prize as watching movies is a favorite pastime. Aside from my nails, I love shoes! And so, when I heard that Posh Pocket Shoes was giving away a pair of red (!) foldable Breton Slip-Ons, I joined the contest. It's bright red and so far, it's a head turner everytime I wear them. 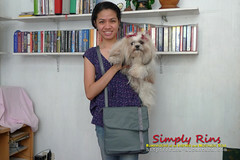 I have a new favorite everyday bag thanks to the contest hosted by Pacsafe and the Out of Town Blog. I wrote an article about Personal Tips On How To Travel Safe and Light. I got lucky and eventually claimed a Pacsafe Slingsafe 200. 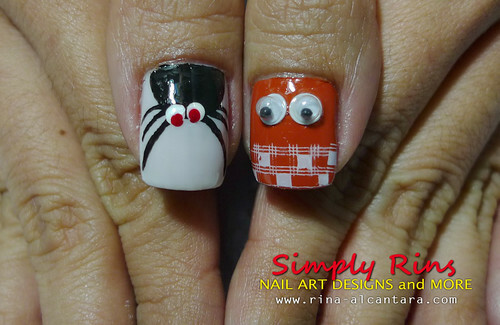 Finally, before Simply Rins turned one, my nail art design won at Polish Freshie's Halloween nail art contest. The highlight of this blog's 1st year was my project to create Halloween nail art designs for the whole month of October. I posted at least 2 designs per week. It was also the month that I started receiving inquiries and other messages through email. My followers also grew. I'd like to thank my fellow nail art enthusiasts who got inspired by some of my nail art ideas and actually tried to recreate it. It is truly an honor. And of course, I'd like to thank all those who takes time to comment on my posts/articles. I really do appreciate them. Happy Blog Birthday!! I'm so in love with your cupcakes and wish I had SOME skill for free-hand so I could recreate them. Thanks a lot, ladies! :) I didn't notice it I posted such a long entry. I hope I didn't bore anyone. happy anniversary simply rins! more power and more blog post and nail art tutorial from you! happy anniversary. i really enjoy reading ur blogs. more nail arts on my nails please. naku rinz.. simpleng freehand lang nagagawa ko..LOL im so thankful nga lanag at may konad..LOL!! again, Happy blogoversary!! have a greatr weekend... im also a red lover just like my mom.. hehehe!! ahhh omg the pig & the cupcake is soo cute<3 I love how u added those lil beads for the sprinkles.